Is it just me or does it feel like today is a new beginning? Maybe it’s because yesterday was Easter, or that spring is finally starting to show it’s face or that I’m back from my break and am back to ‘real life’ but something definitely feels new. This is the time when we clear out the dust from our homes, clean out the clutter and junk from our lives and start anew. I did a similar version of that this week and weekend. I organized the closet and all my newly acquired baking supplies and implements and finally gave the kitchen a good ol’ fashioned scrub down. Which is desperately needed after my weekend bake-a-palooza – it had been in a constant cycle of baking, cleaning, baking, cleaning since about Thursday 🙂 It’s been nice to actually put things away. I said that I’ve been on a constant baking cycle since Thursday, which was cookie drop day. If you recall, this week’s drop was at the New York Center for Rehabilitation and Nursing. It was a quick drop this time, for one, there’s nothing to patronize, and I was double parked. 21st Street is somewhat of a crazy strip and I feel lucky to not have been ticketed. The gentleman at reception seemed appreciative and more of the pick up and reveal of this week later. On Thursday, I also swung my Michael’s and picked up a few things from Wilton to help with my actual decoration of things. 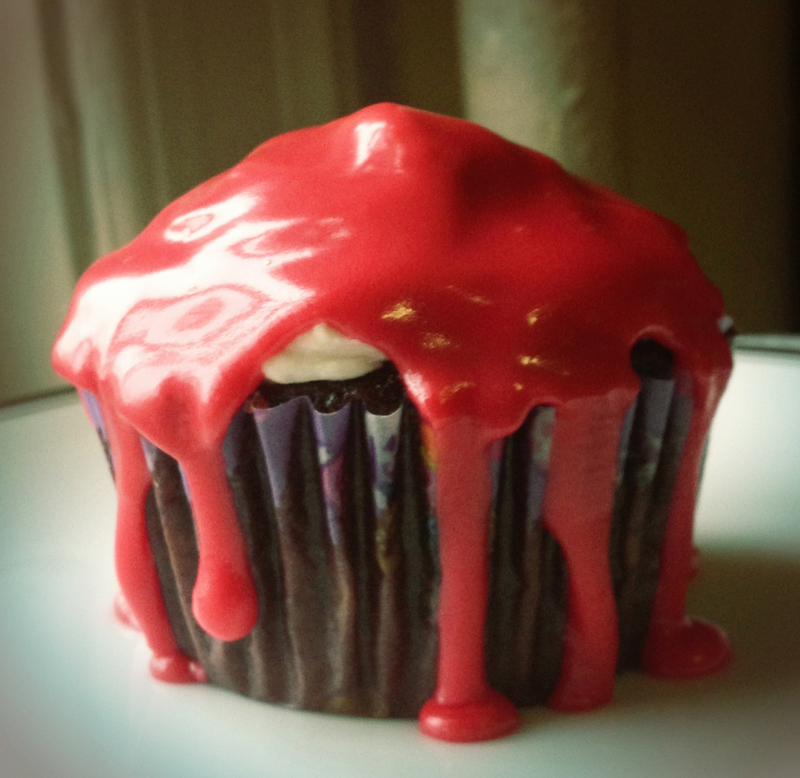 I’m still working on it, but here are some cupcakes that I made for Kickshaw’s 2nd Anniversary on Thursday. Now, for those that follow me on Twitter and Facebook have seen some ideas I’d been tossing around involving cookies and bacon, or cookies and smoked salt. My Twitter followers may have also seen some communication with Maker’s Mark. I decided that this weekend, being on break and having my roommate gone (free to make as big of a mess as I want), would be the perfect weekend for experimentation. I gotta say, what a success! I know that putting bacon in things and combining bacon with sweet things is not a new idea, and I know that there are probably plenty of recipes out there. 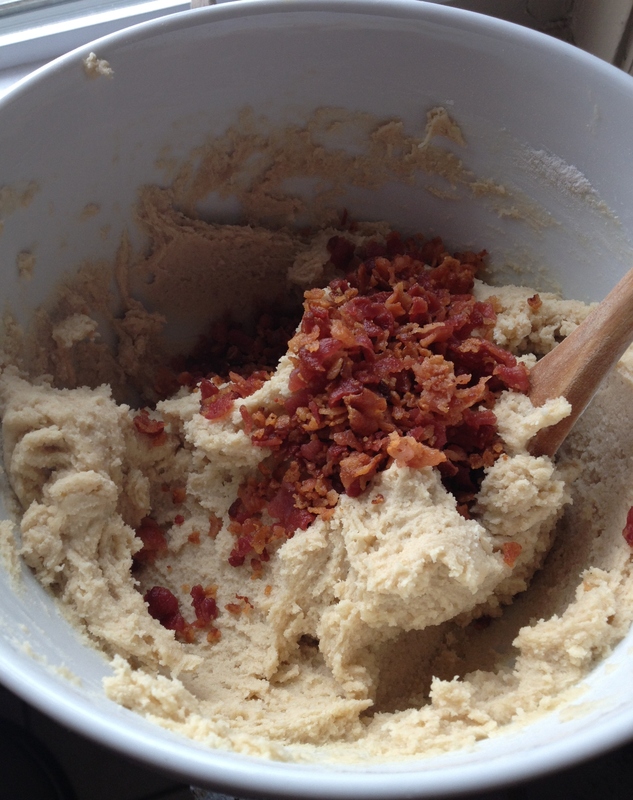 But I decided that I was going to go rogue and just mad scientist this whole bacon cookie idea. I figured a shortbread cookie would be the perfect vehicle for bacon because they’re not that sweet, and are a bit more on the savory side thanks to all that butter. I was right. First thing I did was cook up a package of bacon so it would be ready when I made the shortbread dough. The second thing I did was eat half of the bacon. It’s shocking how little a full package of bacon actually yields, after I ate half and crumbled the other half, it was only a little over a quarter cup. All I did was add that quarter cup to a classic shortbread recipe and voila! 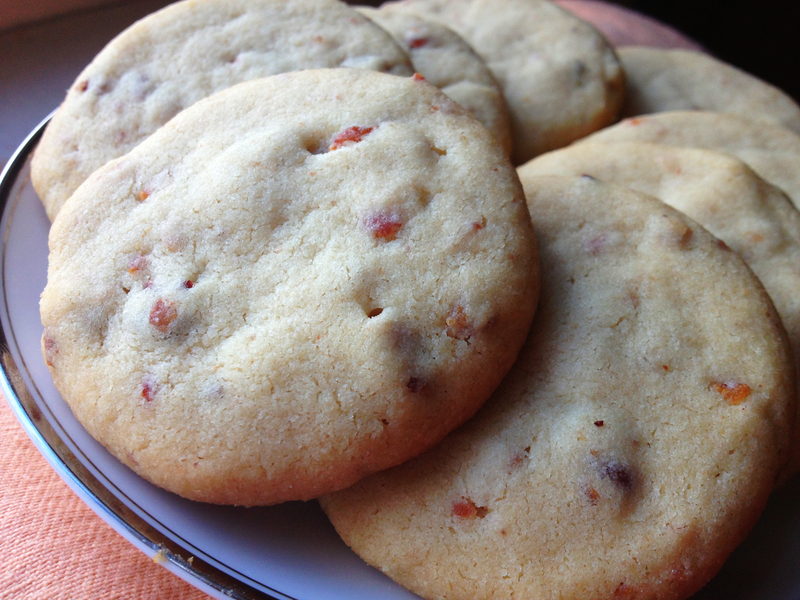 Bacon Shortbread Cookies! There are so many variations you can make with this, maple syrup instead of sugar for maple bacon shortbread cookies, adding some Maker’s Mark into your dough, drizzling the finished cookies with chocolate. And you’ll be pleased to know that I’ll be posting the recipe on the coming-soon recipe page! I must give credit where credit is due and thank my mom for her genius in this. 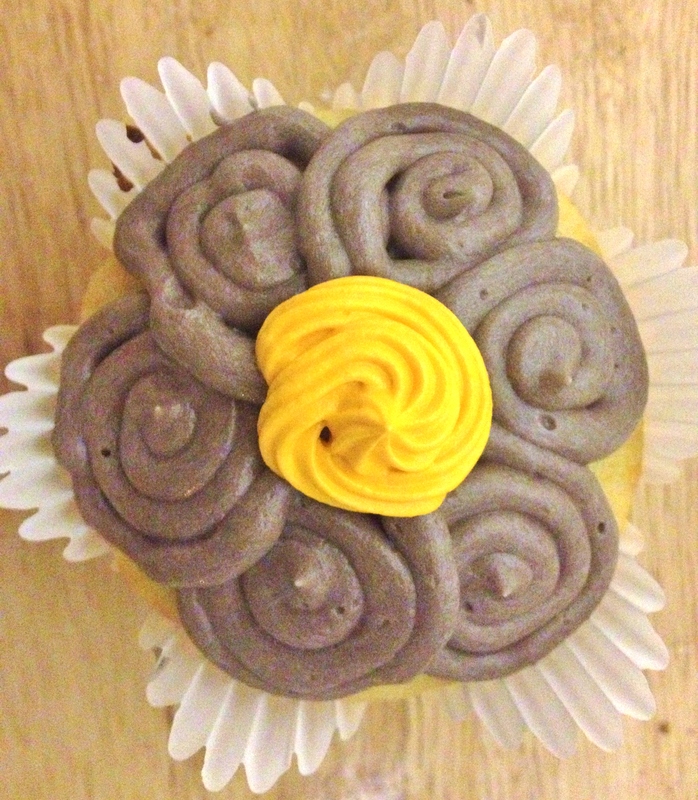 We had been brainstorming about what the cupcake would be and how to tie it to my project of Single Girl Cookies. She called me back 15 minutes after we had hung up with this idea, “What if you called it ‘Make Your Mark'”? Pure brilliance! That’s certainly what I’m trying to do with SGC and also part of what Maker’s Mark’s philosophy is. I took some up to Singlecut, and took the rest to my church choir for Easter and the response was an overwhelming “AMAZING”. I must admit, this is perhaps one of the best things I’ve ever made. 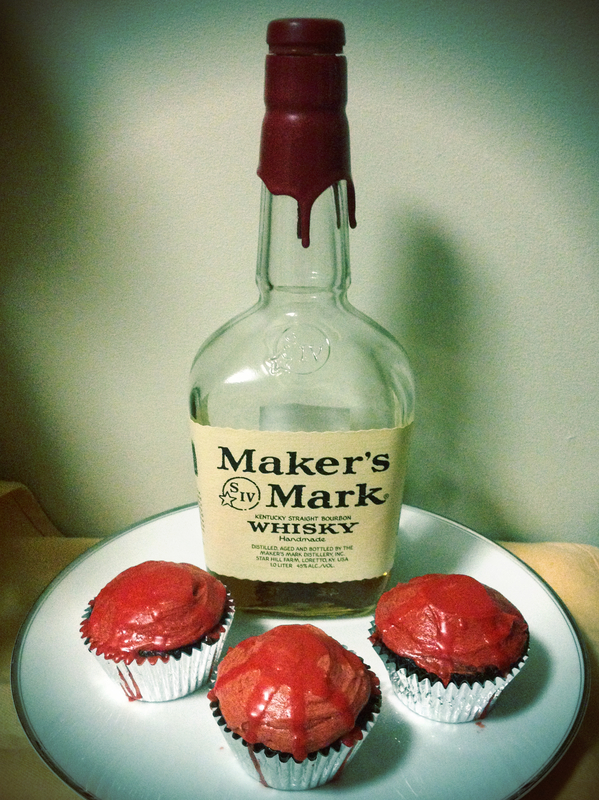 I emailed the recipe to Maker’s Mark and I hope to hear from them what they think! I was thinking I may also include this on the new recipe page. Whaddya think?? 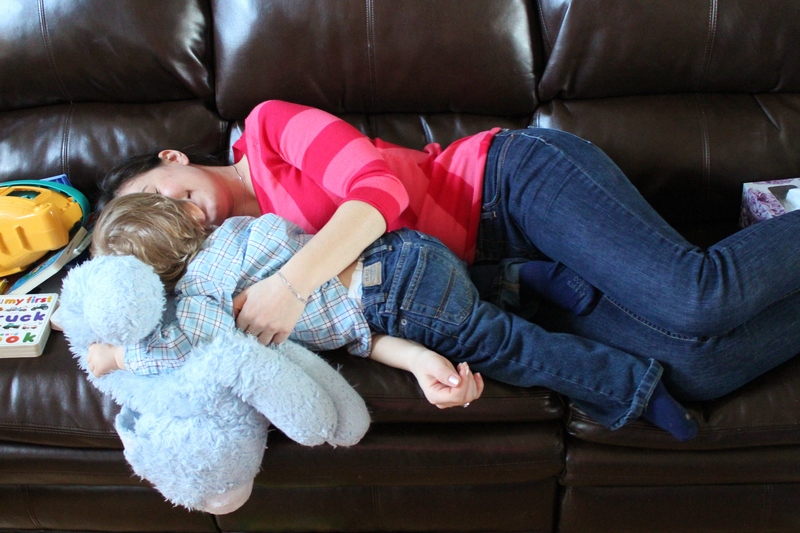 For many of you, yesterday was Easter Sunday, it was for me. It’s a time to spend with family and those you love, or for those like me whose family is far away, doing something you love. I thought it was the perfect day to stop by NYC for Rehab and Nursing to pick up my plate and see where they send me. I spoke with a young man at reception named George who told me he had a few cookies himself and that they were really good. I asked him for the recommendation for this week and he asked me what I was looking for, to get my name out, to start a business, what? I explained to him the whys of what I’m doing; he was going to tailor his recommendation based on my needs. I said that’s sweet but the nature of the project calls for your input as well. That seemed to make him uncomfortable, as if this were a big decision. Which, upon reflection, it kind of is. Each person’s decision changes the course of where this is going and who feels the impact of this kindness. His answer, in the end, was as appropriate as I could imagine. He told me to go to Andrew & Frank’s Deli on 23rd Ave, that they used to “take care” of him when he was a child and feed him. I’d say that’s pretty deserving. And so we’re back to food places. It’s funny when you ask people who they think deserves an act of kindness like this, how often it comes down to food. Food, that which nourishes our body but also the act of sharing food that nourishes our soul. Have you fed your soul lately?